The damage to Hamam Balegha in Aleppo. Photo courtesy of Aleppo Archaeology. On 24 December 2016 Aleppo Archaeology shared images showing the damage of Shebani Church in the Ancient City of Aleppo through their Facebook page. On 24 December 2016 Aleppo Archaeology shared images showing the damage to the Museum of Science and Medicine in the Ancient City of Aleppo. On 23 and 24 December 2016 Aleppo Archaeology shared images showing the damage to Khasraywa Madrasa in the Ancient City of Aleppo, here and here. A new set of photographs of damage to Old Aleppo are available here. Aleppo Archaeology shared a U-News video of damage to the markets of Old Aleppo here. A number of other photos of damage to buildings in Aleppo can be found on their Facebook page here. The DGAM have shared a number of photos of damage to the Traditional Art Museum, Dar Ghazaleh, and Jdaideh in Old Aleppo here. Additionally there are photos of damage to Qater Aghasi, Mosque of Atroush and Altounbugha, and Jub Alkuba here. Art-Crime blog posts about damage to Beit Ghazaleh in Aleppo, here. The DGAM have shared photographs of damage to Shaizar citadel, and Tebet Al-Imam Museum in Hamma Governorate here. ISIL militants have been looting archaeological sites and vandalizing graves in Kirkuk Governorate (ASOR CHI Incident Report IHI 16-0031). ISIL-affiliated Amaq News Agency alleged a US-led coalition airstrike damaged a mosque in Mosul, Ninawa Governorate (ASOR CHI Incident Report IHI 16-0032). Alleged SARG airstrikes damaged three mosques in Idlib Governorate (ASOR CHI Incident Report SHI 16-0154). Alleged Russian airstrikes damaged two mosques in the city of Aleppo (ASOR CHI Incident Report SHI 16-0155). SARG forces looted a makeshift library in Daraya, Rif Dimashq Governorate (ASOR CHI Incident Report SHI 16-0156). Alleged SARG airstrikes damaged a Byzantine-era site in Hama Governorate (ASOR CHI Incident Report SHI 16-0175). A fire destroyed a historic house in the Saroujah District of Damascus (ASOR CHI Incident Report SHI 16-0176). ISIL-affiliated Amaq News Agency claimed that an Iraqi government airstrike allegedly damaged a mosque in Hawija, Kirkuk Governorate (ASOR CHI Incident Report IHI 16-0034). New video footage and photographs show damage to three churches, a cultural center, and a cemetery in Bartella, Ninawa Governorate (ASOR CHI Incident Report IHI 16-0035). An airstrike allegedly damaged a mosque in Daquq, Kirkuk Governorate (ASOR CHI Incident Report IHI 16-0036). ISIL-affiliated Amaq News Agency claimed that an alleged US-led coalition airstrike destroyed a mosque in Hammam al-Aleel, Ninawa Governorate (ASOR CHI Incident Report IHI 16-0037). An alleged SARG airstrike damaged a mosque in al-Sabha, Deir Ez Zor Governorate (ASOR CHI Incident Report SHI 16-0157). Alleged SARG and Russian airstrikes damaged four mosques in Idlib Governorate (ASOR CHI Incident Report SHI 16-0158). An alleged Russian airstrike damaged a mosque in Qebtan, Aleppo Governorate (ASOR CHI Incident Report SHI 16-0159). 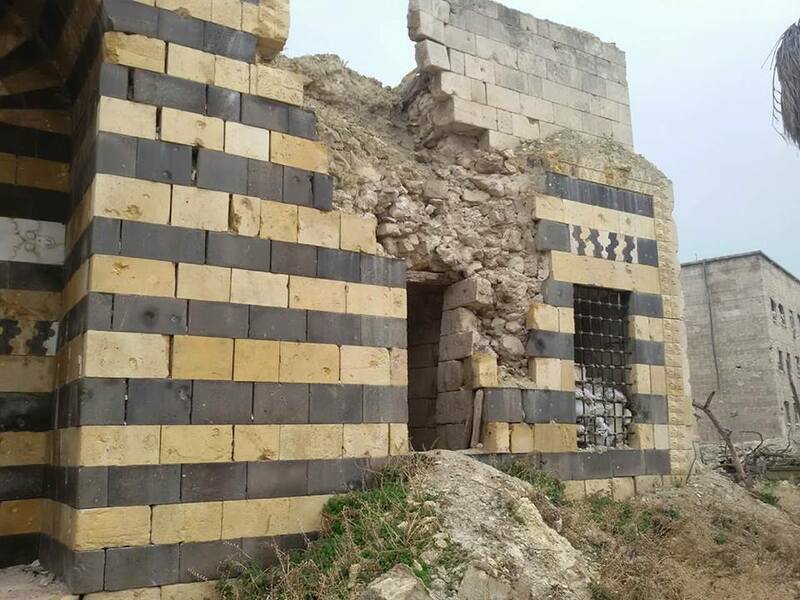 The DGAM reported ongoing looting, vandalism, and theft of building materials from archaeological sites throughout Aleppo Governorate (ASOR CHI Incident Report SHI 16-0160). An alleged SARG airstrike damaged a musalla in Douma, Rif Dimashq Governorate (ASOR CHI Incident Report SHI 16-0169). The Los Angeles Times discusses the increase in fakes in Syria and the tricks used to make them, here. A refugee from the city of Homs in Syria has plans to open an ice cream shop in Halifax, Canada after wining a top grant for entrepreneurial newcomers. Read more at CBC. People in Costa Mesa, California gathered to hold a candlelight vigil At Fairview Community Church where poets and musicians of Syrian origins performed pieces, organized by various local community groups. Read more here. Gulf News investigates the state of Syrian television and the effects of the war on it here. The DGAM concluded a training program organized at Homs for 8 days during the period of 23-30 December, 2016, with the participation of architects, engineers and archaeologists from Homs Antiquities staff and 10 trainees from Damascus, Aleppo, Hama, Idleb, Dara’a, Lattakia and Sweida. Further information is available here. Photographer Jan Oberg travels to Eastern Aleppo to photograph the are and as part of a mission by the Transnational Foundation for Peace and Future Research. The article was released by Global Research and can be found here. On December 10th-11th, 2016, an international colloquium titled “New Visions and proposals for the resilience of the Syrian heritage”, was organized by the Syrian Ministry of Culture – Directorate General of Antiquities and Museums with the Ministry of Tourism in Damascus. The programme for the event is available here. The engagement of archaeologists and cultural heritage experts during times of conflict can be difficult to navigate and their actions can quickly become politicised. Actions can be perceived in many ways in these complex circumstances. In this case, the event created some controversy, with some archaeologists issuing a statement against it (here, also reported in the French newspaper Liberation here). Listen to talks from NYU Florence: Protecting Cultural Heritage in an Uncertain Time here. Open Access catalogue for the Syria: a Living History exhibition, available here. An International Expert Working Meeting: Safe haven for archives at risk? was held in Switzerland. For the outcomes read here. The blog William Carruthers: Fragments discusses the recently held Safeguarding Endagered Cultural Heritage conference in Abu Dhabi, here. New French exhibition on Syria opened on December 21, 2016. Organizers said the display is designed to be an “emotional” experience that takes visitors to Palmyra and other endangered World Heritage sites in the Middle East. The New York Times also covers the exhibition, here, with some photographs of it and 3D models of the sites. Art Media Agency interviews Édouard Planche to discuss the recent international conference on endangered heritage, UNESCO’s goals with respect to curtailing trafficking, and how Syria fits within this program. The Toronto Metro reports on Aleppo confronting the damage left by 4 years of war. Reuters reports on the scars after the battle of Aleppo. Nature Middle East reports on the work of ASOR CHI to monitor Syria’s loss of cultural heritage using satellite imagery. Read more here. Syrian painter in Douma turns bombs into art. Middle East Eye interviews artists about inspiration here. Syrian government begins clean up of rubble from formerly rebel held areas of Aleppo, The Daily Mail reports. The National reports on the task of rebuilding Aleppo, giving special attention to plans on heritage architecture. The Wire reports on the Syrian Seed Bank in Tal Hayda still operating despite the conflict. The Antiquities Coalition’s Deborah Lehr writes about cultural racketeering and blood antiquities here. To learn more about antiquities trafficking see Tess Davis of the Antiquities Coalition discuss Trafficking Antiquities, from Temple to Museum, here. Speaking at the International conference for the Protection of Cultural Heritage in Conflict Areas in the Emirate capital Abu Dhabi, the Mufti reiterated Islam’s deep commitment to the preservation of historical heritage and condemned the “terrorists who are destroying this heritage that belongs to all human beings.” See more on this here. Reuters reports on the US attempts to sue to recover Syrian Antiquities, here. A senior German archaeologist, Professor Andreas Schmidt-Colinet, who worked as head of the Syrian-German archaeological mission for decades, has urged the international community to work on protecting civilized heritage of Palmyra (Tadmor city) and preserving its cultural identity, here in the Syrian Times.